Late March we decided it was time to visit our youngest daughter in Florida. Not being fans of hot weather, we dreaded the temperatures we might face but we hoped that Florida in early spring would not be too unbearable. It was ironic then, that we drove through a snow squall on our way to the airport and were greeted at our destination with temperatures in the mid-70s. It was also amusing to hear from people during the course of our weekend that the weather was a bit cool for this time of year. For us, mid-70s was absolutely perfect. I certainly would not have wanted it any warmer. During our first full day in Florida, our daughter took us to a section of the Everglades near Miami called Shark Valley. As we left the populated areas, we noticed that the road was surrounded on both sides by tall grass as far as we could see. We later discovered that this was actually known as a sawgrass prairie and that the sawgrass was actually a sedge rather than grass. I also found it interesting that the occasional cluster of trees dotting the landscape was referred to as an island of trees. 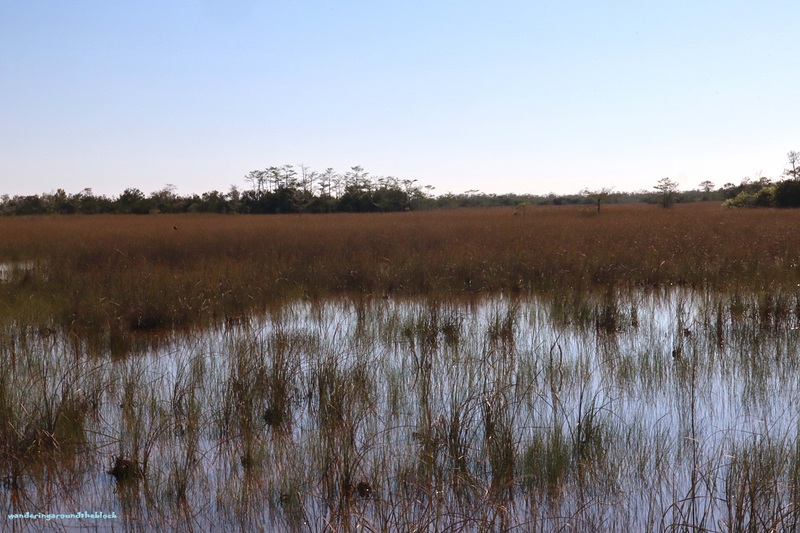 Once we arrived at our destination, we signed up for a tram tour that would take us around the 15 mile loop within this area of the Everglades. This was a very informative two hour tour narrated by one of the park rangers assigned to Shark Valley. The first thing we learned was that the area was named for the Shark River and that this was indeed a valley. The Shark Valley was actually only 7 feet above sea level, surrounded on one side by the Western Coastal Ridge rising 14-17 feet and the Atlantic Ridge rising to almost 20 feet on the other. So yes, we were technically in a valley. Our driver kept a sharp lookout for the various wildlife in the area, slowing down so we could get a good look at our surroundings. 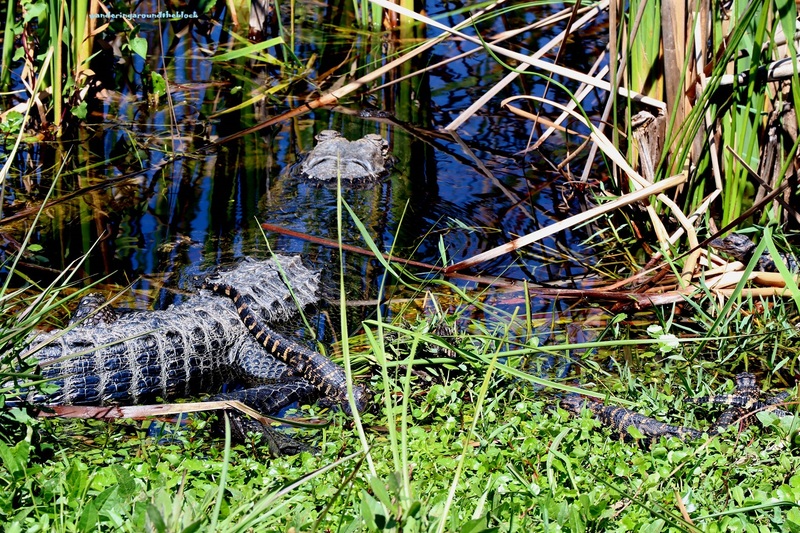 We certainly saw plenty of alligators that day. These beasts just lay there sunning themselves along the side of the road. I think we saw alligators every few yards. We even saw quite a few that were surrounded by their young. Our guide also pointed out the turtles a number of times but to be honest I never found them; could be because I was in the center seat or they blended in with their surroundings. I finally spotted one turtle when we were walking along the road near the visitor’s center. As we rode around the loop, I noticed a number of birds that I thought were cormorants for they were drying their wings in the same manner. On closer inspection, I discovered that their wings actually had a silvery sheen to them and the beaks were a different shape. Our guide informed us that this bird was an Anhinga and had similar behaviors to the cormorant. 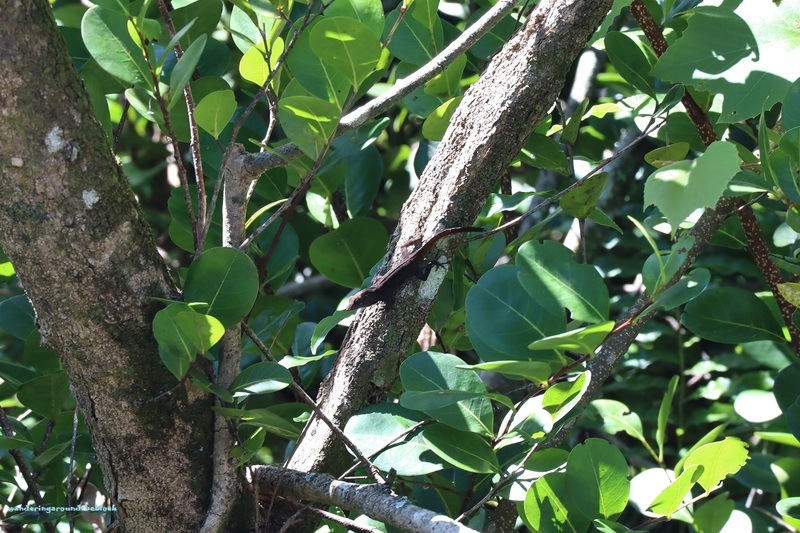 The female however, was quite distinctive with her light colored neck and head. It wasn’t long before we discovered that we were in a bird watcher’s paradise. I soon lost count of the different birds that we spotted. 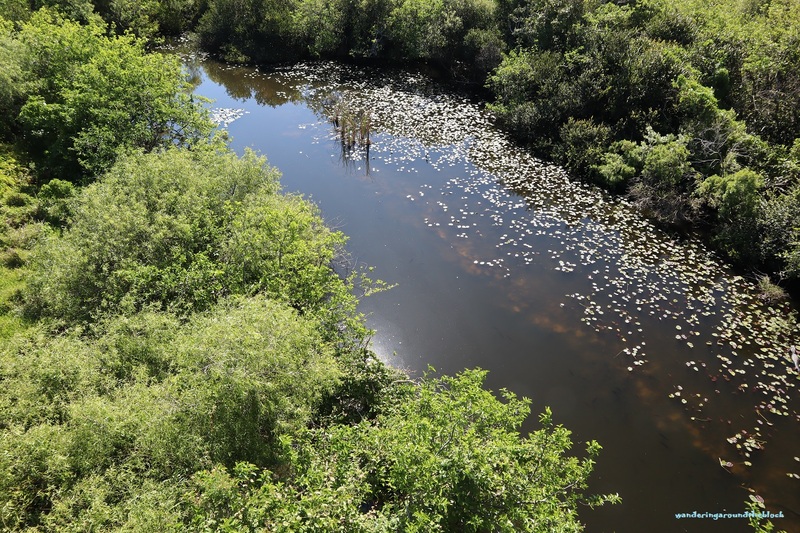 Along our journey, I do remember seeing Snowy Egrets, Great Egrets, Roseate Spoonbills, Great Blue Herons, a Red Shouldered Hawk and a Green Heron to name just a few. On our return to the Visitor’s Center, we found a bench where we could watch the wildlife nearby while we enjoyed a snack. It was here that I had my sole sighting of a turtle. 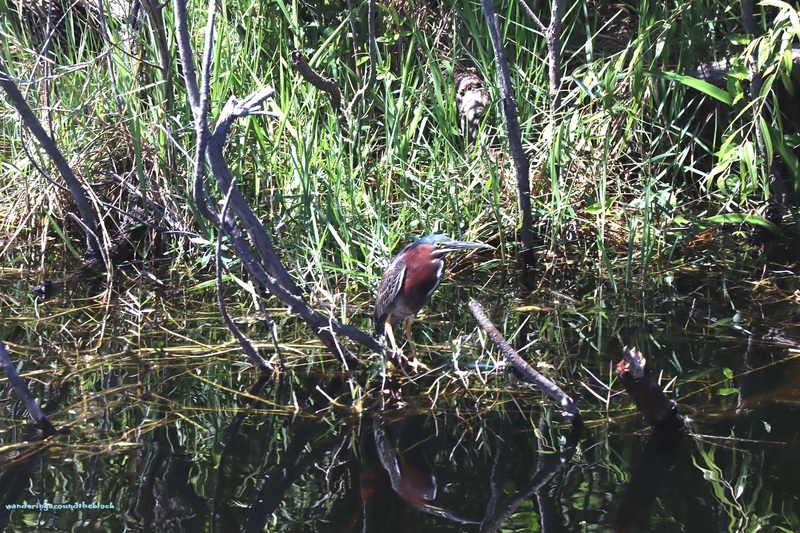 We also had a clear view of a female Anhinga and a Green Heron. 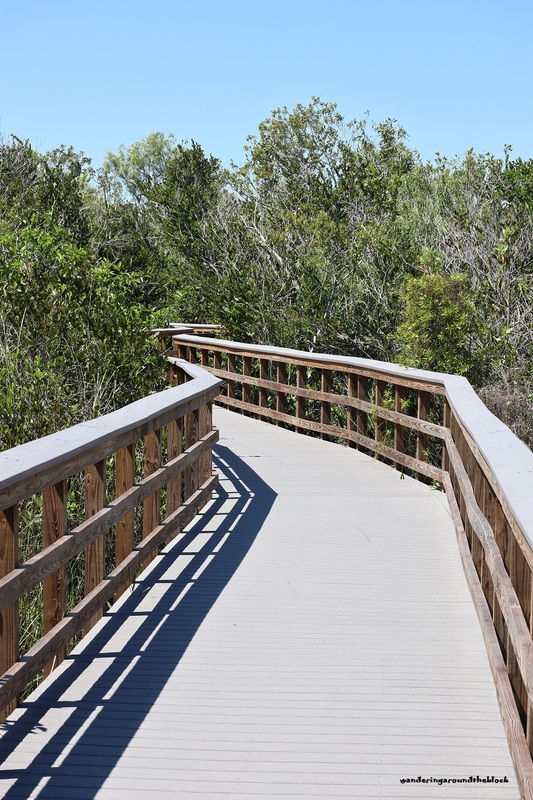 After our snack, we strolled along a short boardwalk trail that wandered through a hardwood forest before retreating from the heat and turning back towards our home base. By the second weekend in March, we discovered that we were in for a few sunny days and temperatures were beginning to warm up a bit, so we knew we had to spend those days outdoors. It was time to take some more ambitious outings than our usual winter fare. Revisiting the Camden State Park to climb both Bald Rock and Cameron Mountains over the next two days was the plan. First, we had to decide whether our micro-spikes would be enough to maneuver the trails or would we need snow shoes. 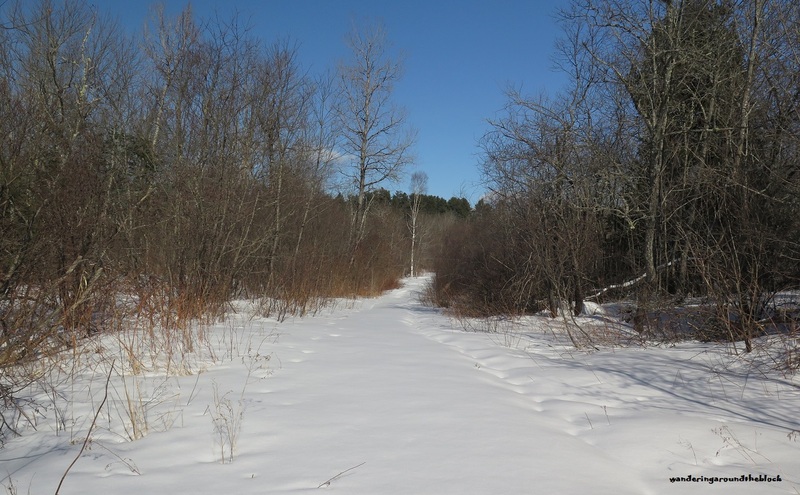 Even in the winter, the Multi-use Trail was heavily used. This meant that by the time March came around, the footprints left in the snow could be a mass of frozen ruts, making for some very uncomfortable walking. And yet, the recent snow, although not deep would make for some very nice snowshoeing. Figuring the snow was not deep and we would not need the snowshoes, we opted for the spikes. 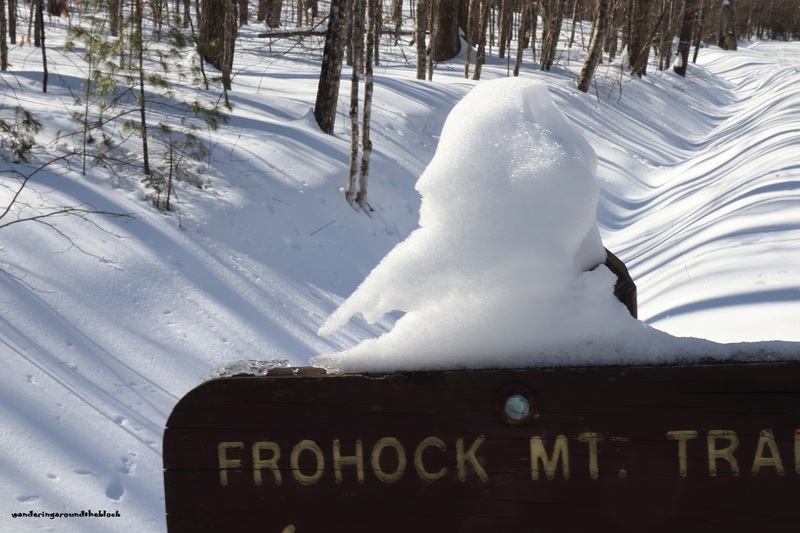 When we arrived at the trail-head, we were pleasantly surprised to find that the trail had been nicely groomed by snowmobilers prior to our arrival, leaving us to believe that this hike would be a piece of cake. 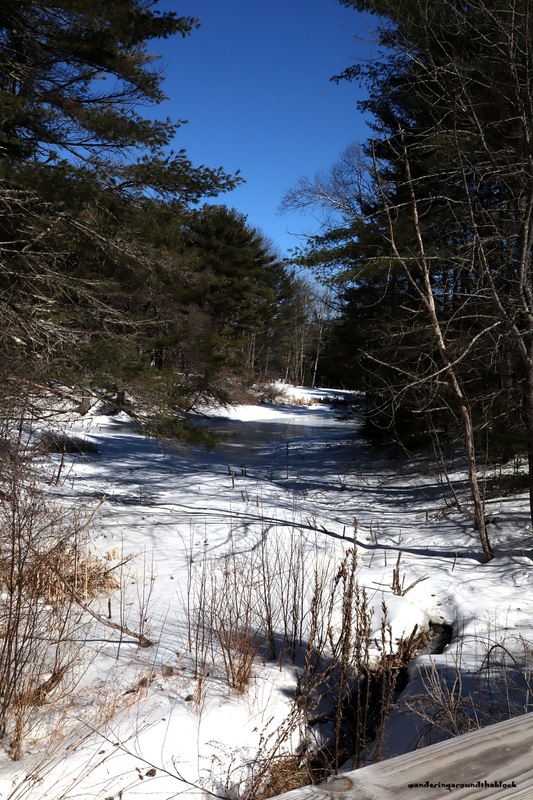 Of course, we did not take into account that the warming temperatures were leaving a slushy snow on the ground, a consistency I likened to hiking in sandy conditions found in Pine Barrens. So, on the one hand, our hike was easier than expected but not as easy as it could have been. Still, we were thankful for the groomed trail and blessed the snowmobilers for making it so. Even with micro-spikes the going was a bit slow, since we slipped back a bit in the soft snow. As a result, we paused at the Frohock Trail for a breather before taking on the incline located at this section of the road. Looking at the trail marker, I smiled at the snow on the top of the sign. To me, it looked like a creature with arm outstretched, pointing to the trail below. 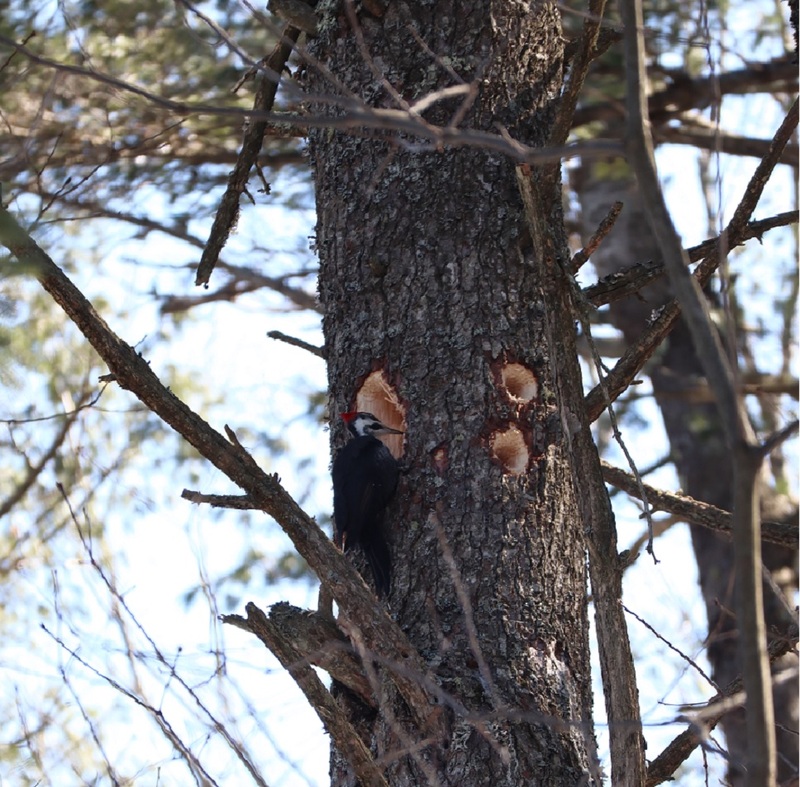 Once we reached the Bald Rock Trail, we spent some time looking for and then admiring a Pileated Woodpecker hard at work. We spent at least 15 minutes watching this bird expanding the hole he was creating. Occasionally, he would pause and study us before going back to work. Once we were ready to move on, we were surprised to note that the snowmobiles had made it all the way up this narrow trail to the summit. 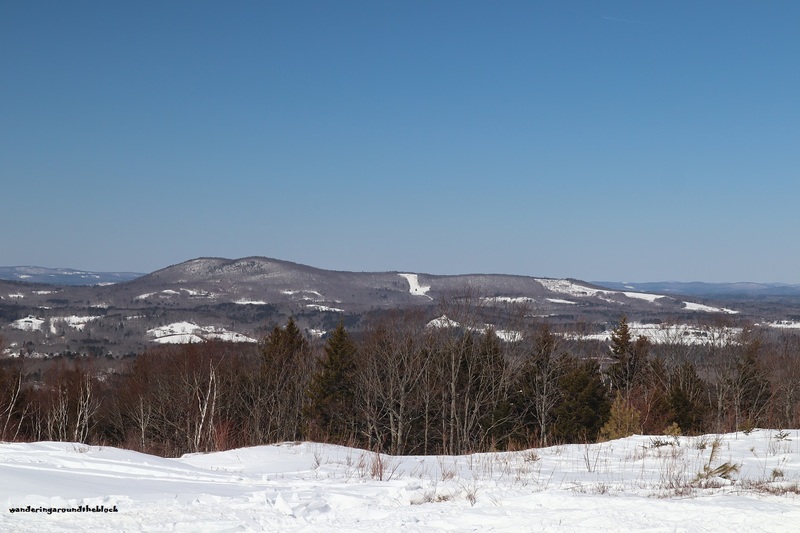 Due to our frequent stops studying snowy sculptures, busy woodpeckers and vegetation showing signs that spring was near, it took us almost 2 hours to reach the top of Bald Rock Mountain. Double the time it usually took us to travel this path. We found a tiny bit of clear rock to rest upon while we enjoyed a snack and the views of Blue Hill and the mountains of Acadia. 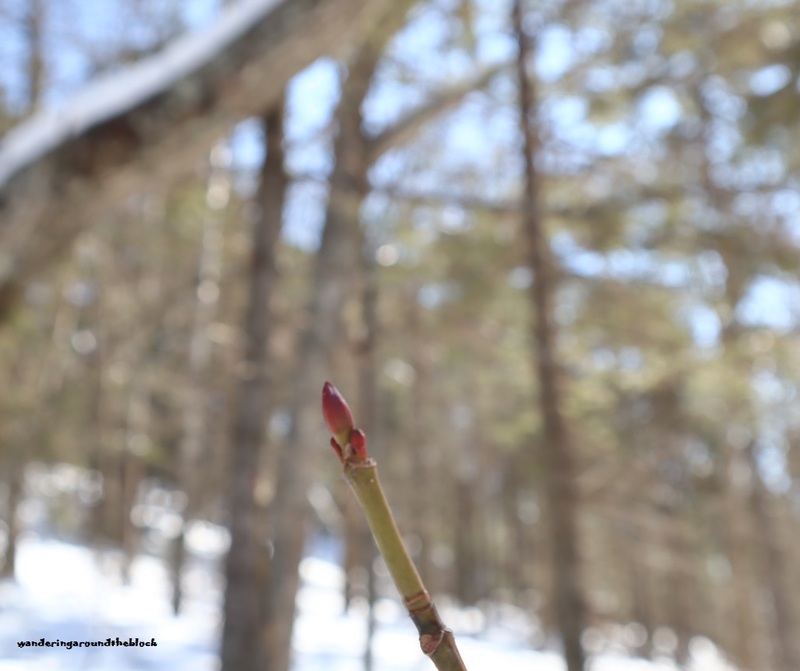 As we were leaving the mountain top, I noticed some trees with white swirly tendrils hanging near the buds. I was not sure if these were remains from the previous year, or early signs of this year’s growth. 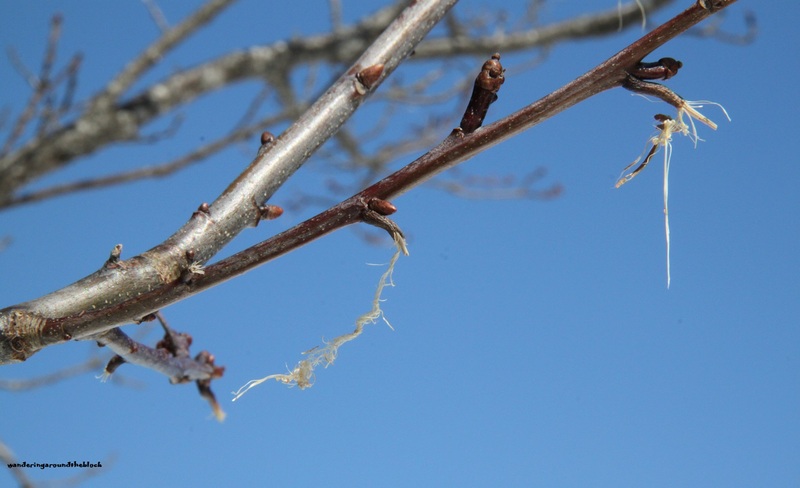 These trees were on the summit and exposed to direct sunlight, so they could have been early blooms. 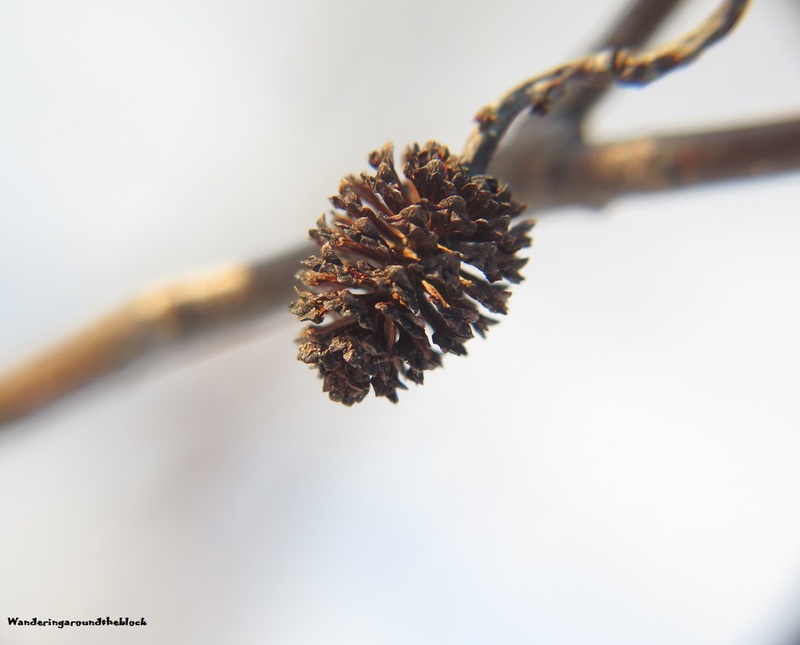 On one of the trees, we found a lone acorn of some sort so they could have been oak trees but I was still not certain. I would be grateful if anyone could supply more information on this. The next day, we followed the same route up the Multi-use trail to the Cameron Mountain trail with a friend (this trail is directly across from the Bald Rock Mountain Trail). This time we used alpine snowshoes for a little more traction. 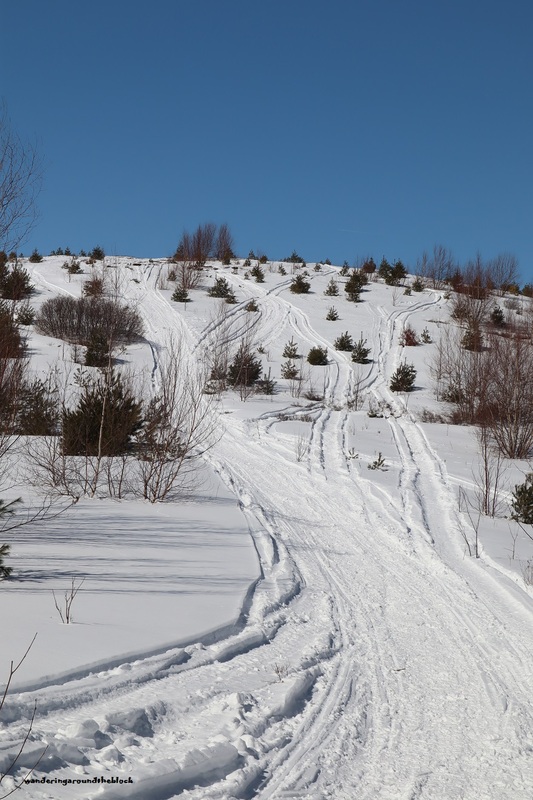 Since the Cameron Mountain Trail was designated as a snowmobile trail, we were not surprised to see that they had made it up to this summit as well. It was a bit windy on the exposed summit but we were determined to have a snack before turning back. 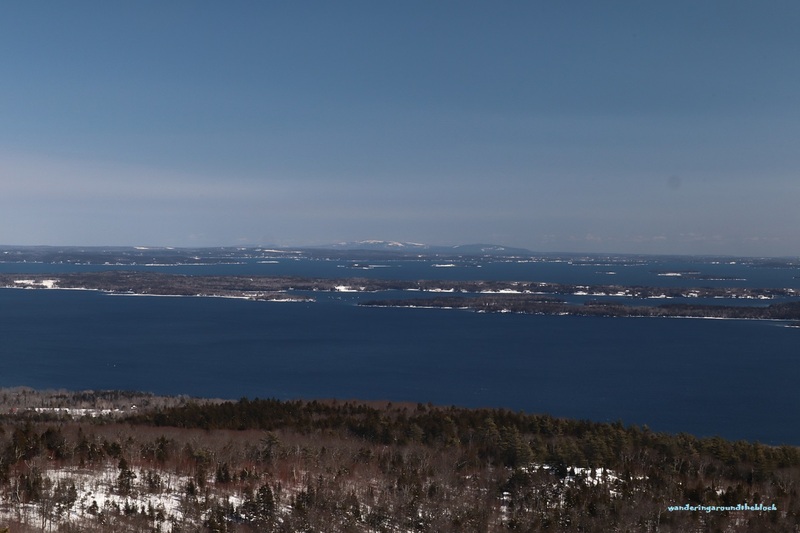 We admired the views of Megunticook Lake below us and the mountains beyond before the wind forced us to return back to the protection of the woods. During the first weekend in March, we headed to Belfast to do some errands. I knew that there was a tiny preserve nearby consisting of a trail that was less than ½ mile. Naturally, I thought this would be the perfect opportunity to explore the Stephenson Preserve. Once done with our chores, we headed towards the Belfast Rail Trail parking lot near the remains of the Upper Bridge. From there, we walked the short distance up the road to the Stephenson Preserve. Given the cold temperatures the week before, we assumed that the snow had turned to ice and that our spikes would be enough for this short exploration. It was a false assumption on our part. After climbing over the snow bank created by the plows, we discovered that the top part of the snow was pretty crusty but not firm enough to hold our weight. At each step, we fell through the snow up to our knees. We thought that conditions might get better as we entered the woods, but no such luck. In a very short amount of time, we decided that continuing on this path was not going to be a pleasant experience, so we opted to turn around and walk along the Belfast Rail Trail instead. The conditions on the Rail Trail were okay but not great. The prints of those who had walked this trail over the last few weeks had frozen, making for some difficult walking. We found that we needed to watch our step walking through the ruts. Sometimes you would catch an icy edge causing your foot to twist, or you would catch a soft spot and quickly slip through the surface. These conditions required a different approach to our explorations. Instead of looking around while we walked, we needed frequent stops in order to observe the world around us. Having said that, we did have some wonderful views of the frozen river alongside the trail. 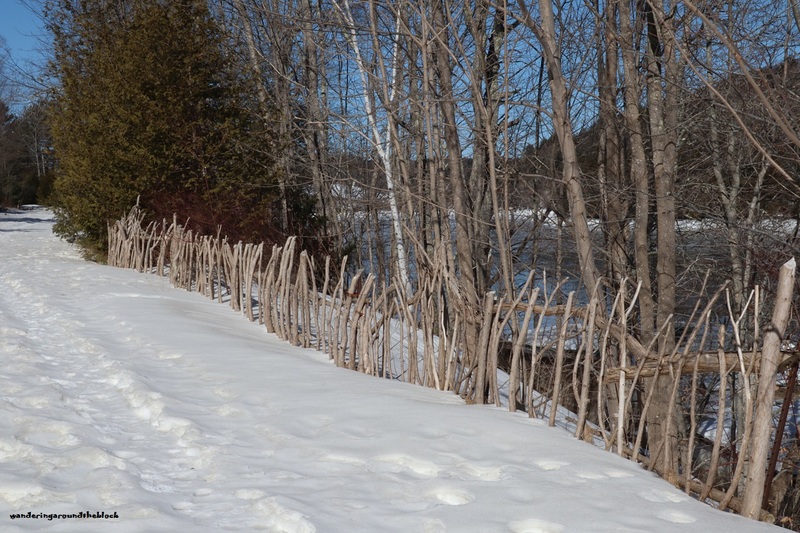 Early on in our walk, we found a rather interesting fence separating the trail from the water below. The fence seemed to be made from whatever twigs the builder could find. We found a few of these fences during our journey but on the other side of this one, I caught a glimpse of a shack down by the river bank. It did make me wonder if these structures were separating the trail from private property. As we continued our walk, we found some interesting rock formations on the road-side of the path. Not far from the rock formation, we found dirty ice balls along the rail-bed and realized that this debris was the result of plows clearing the road above us. Further on, we found a small clearing on the river side, containing a lone picnic table. I am sure it was the perfect spot for a warmer day reverie. From this point, the trail conditions deteriorated quite a bit, creating a rather uncomfortable walk. Rather than walk all the way to the City Point train station, we opted to turn around at the Trestle Bridge. 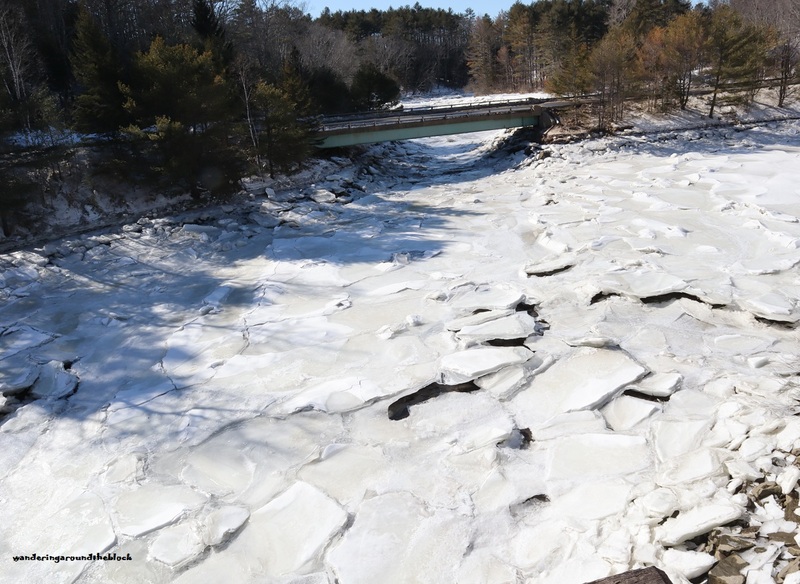 On the return trip, we spent some time studying the broken ice formations in the river and a wooded area that had the characteristics of being a wet area. It had been a wonderful, sunny day to be outside but now it was time to find some lunch. As I had mentioned in some of the last few posts, my husband had gotten me an adapter kit and some lenses for my compact camera. He had been suggesting for a while I use his DLSR camera in order to get better pictures for my blog but I always felt that both the camera and the lenses were too heavy for me. I also did not want to take the extra time to pull the camera out of the backpack (an issue I have with the camera attachments for the compact camera as well), set it up, take the picture, put the camera back and adjust the backpack. This took time. I did not want my adventures to be photo shoots. That was not my goal. I wanted to be outdoors exploring nature, and taking the occasional picture of something I enjoyed seeing. Still wanting to improve my photography skills, my husband surprised me with a new camera for my birthday. I received a Canon Mirrorless camera EOS M50. It came with 2 lenses; what would be my go-to 18-45mm lens, and a telephoto 55-200mm lens. So yes, the camera had interchangeable lenses but the biggest plus was the fact that the camera with my go-to lens felt as light as my compact camera. And recent reports seemed to indicate that these smaller cameras produce photos just as good as the DLSR cameras. All this research revived my husband’s interest in his long abandoned photography hobby so that one sunny day, we both grabbed our cameras and decided to give my new toy a test run. I thought a walk to Barrett’s Cove would be the perfect place to get some interesting pictures. 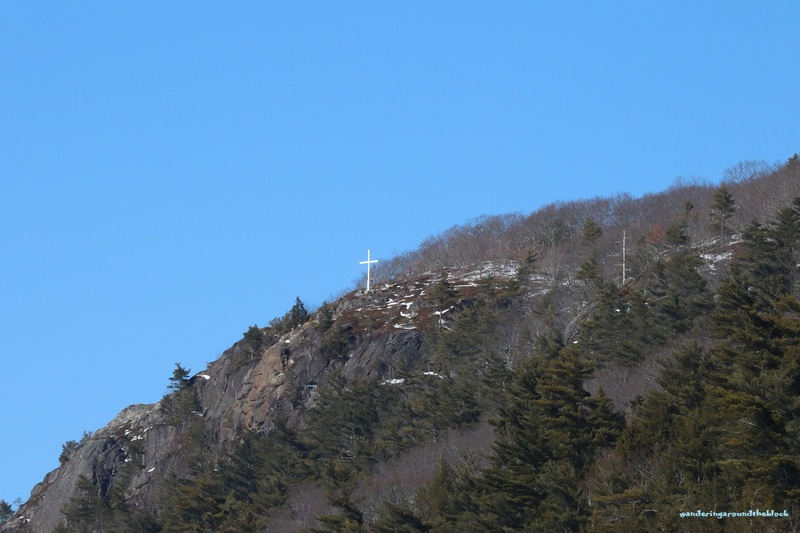 It certainly seemed a good place to test the telephoto lens since I had never been able to get even an okay shot of the cross on top of Maiden Cliff. The cross is visible from the beach but even with the telephoto attachment for my compact I was not overly impressed with the results. This time, however, what a difference! The image was so nice and clear, no matter what setting I used. After that, we just played with our cameras. 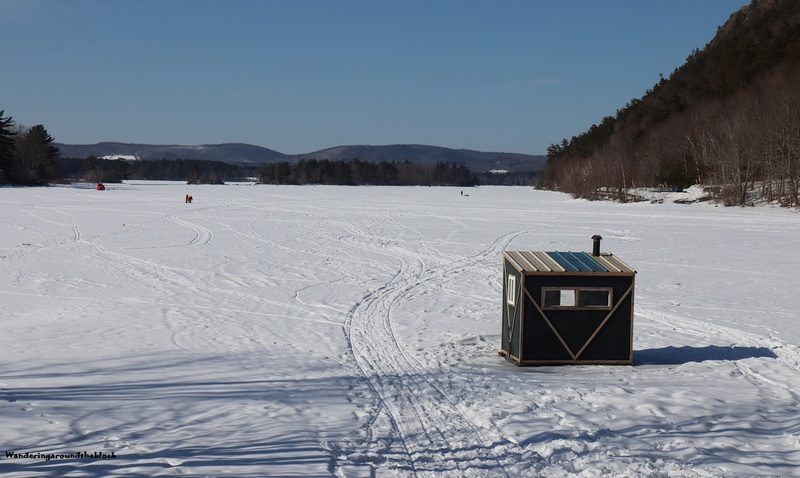 I enjoyed capturing the activity occurring on the lake; the fishing shack, people walking towards their various fishing holes, snow mobiles racing across the frozen water. People were just enjoying a beautiful, clear day. 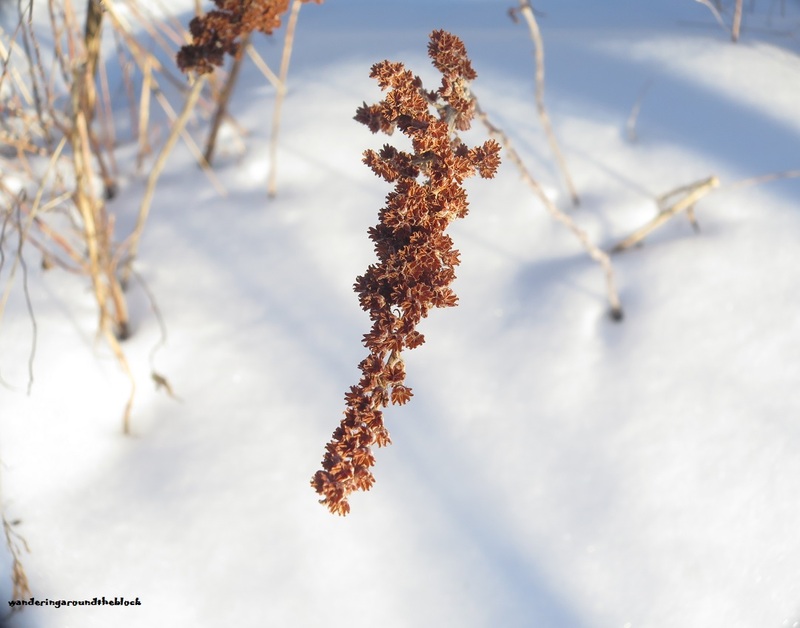 I also loved the juxtaposition of some warmer season objects against the snowy landscape. 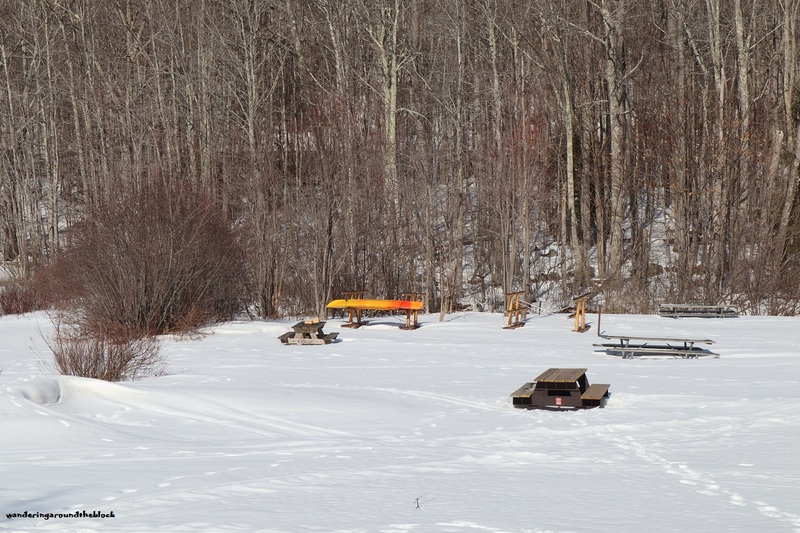 The lone kayak left on a boat rack for the duration of the winter looked so out of place in the snow. I also liked the half buried chairs surrounding a fire pit that was no longer visible. There were a number of other test shots but these were my favorites. Overall our test run was a success. I think I will like my new camera and hopefully will get better pictures. After all, a better camera does not necessarily create a better photographer. My next task will be to figure out what will be the best option for me to carry this new toy around on my adventures. Just before the last weekend in February, we finally had an all snow event that was not followed by rain. Hurray! At last there were perfect conditions for some snowshoeing! 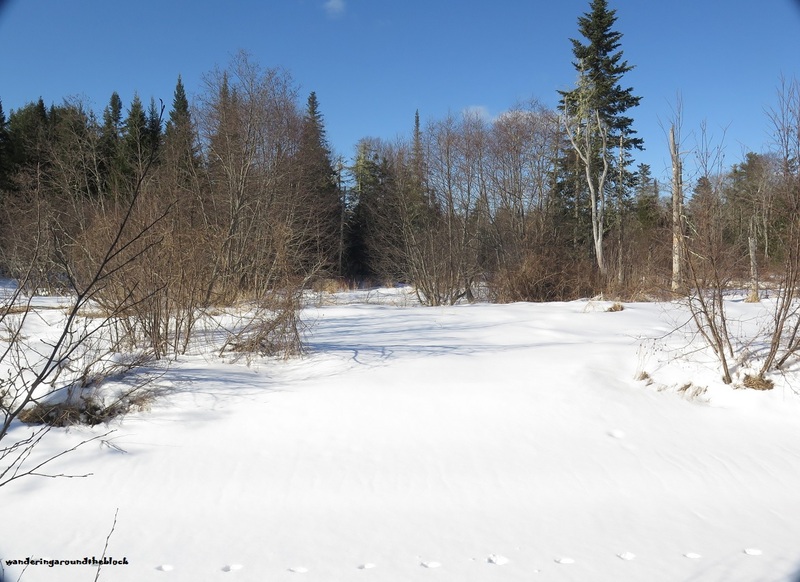 That Friday, we threw the snowshoes in the truck and headed up to Stockton Springs to explore Main Stream, a preserve we had not explored before. Our primary reason for hiking this trail in the winter was that I heard that not only was the area pretty wet, but that the walk to the trailhead was grassy. Those two characteristics brought to mind mosquitoes, black flies and ticks. Even though we used nets during fly season and insect shield clothing to combat the ticks, we also did not believe in tempting fate. When I was informed of certain trails being overly populated by ticks, I knew that would be an off-season hike. 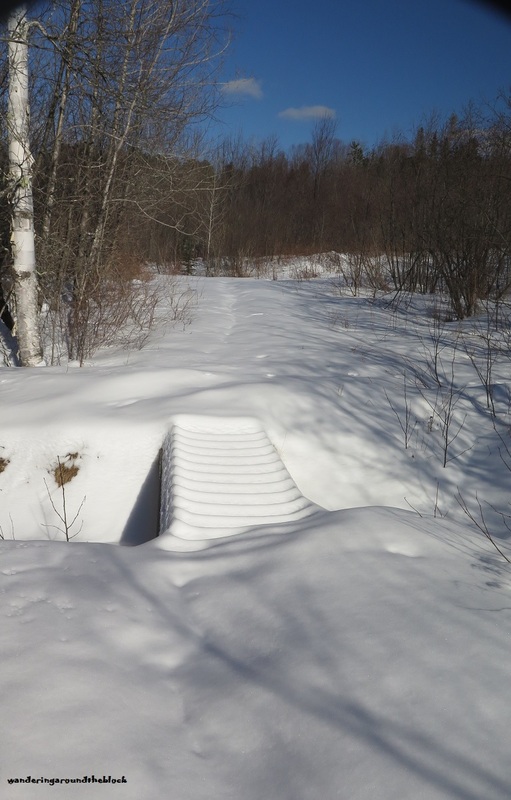 When we arrived at the preserve, our first task was to climb over the snowbank left behind by the plows. Once we crossed over that obstacle we discovered that we were the first to break the snow. Knowing the hard work involved in that task, I let my husband go first to create the trail (generous of me, I know). 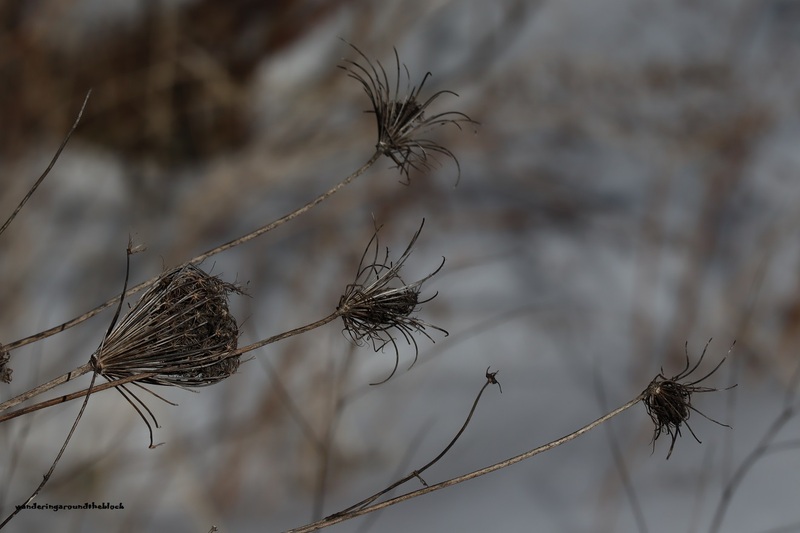 As we walked down the long lane before us, I noticed the remains of a variety of golden rod. I also noticed the swelling of a few buds on some of the bushes nearby. Looking up, it seemed the tree tops displayed the reddish hue of spring. 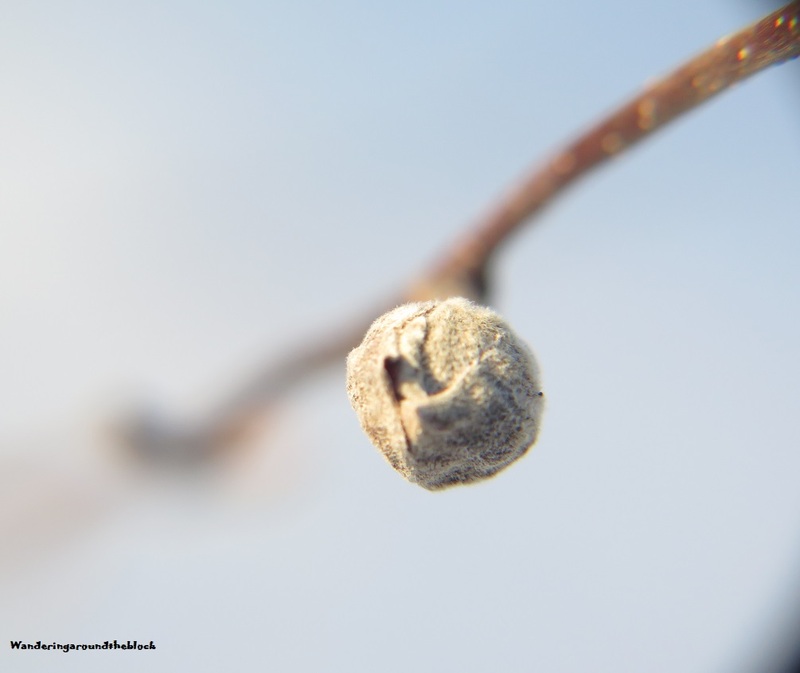 The days were getting longer and there were definitely signs of new life if one knew where to look. Off to one side of the lane, we noticed an open area that we assumed would be wet during the spring and summer. 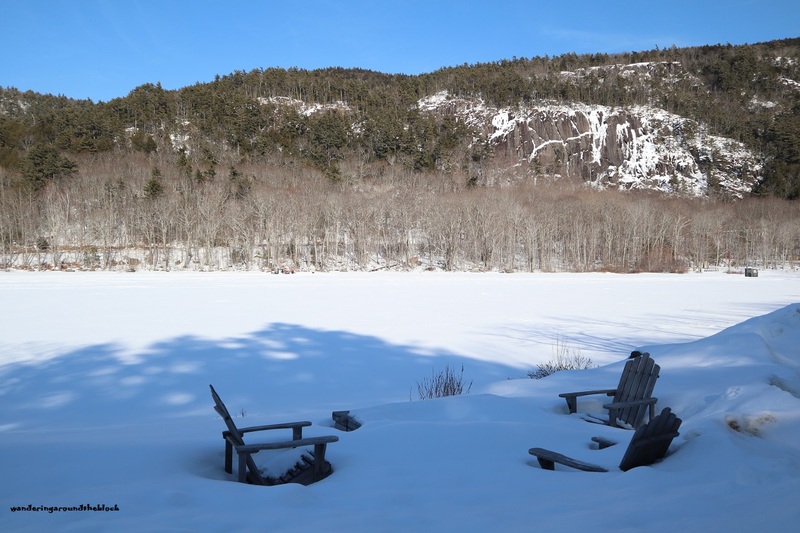 In winter, all we could see was an open expanse of white with terrain that suggested a riverbank. Down the middle of this landscape were animal tracks following the water line. We would find these same prints multiple times during our journey. The path we were on continued for another .3 mile before reaching the actual preserve property. We stopped long enough to admire a snow covered bridge. 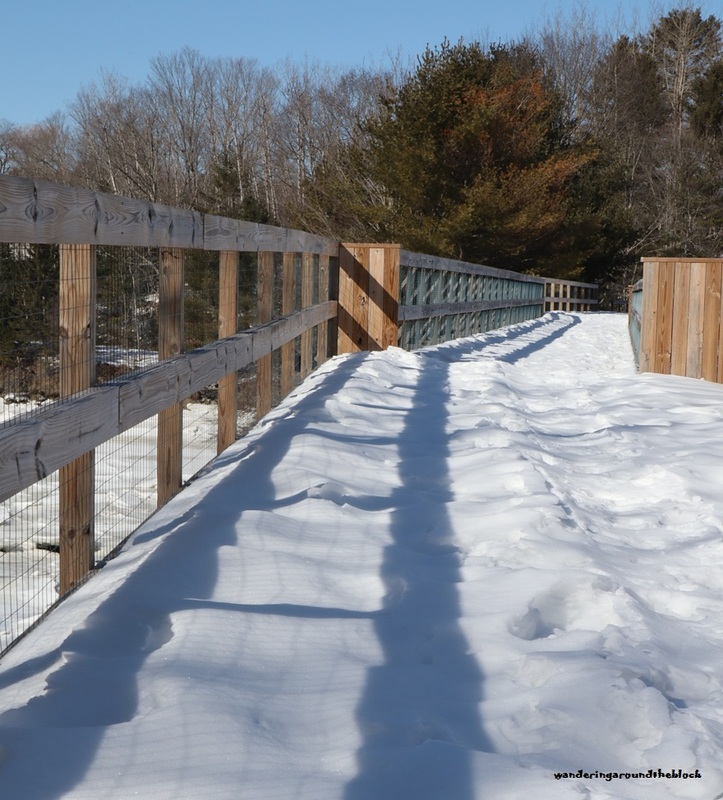 I felt privileged to being the first to take in the beauty of the untouched snow blanketing the bridge and the land beyond. Once we crossed the bridge and dislodged the snow, that vision was unfortunately gone for those who would come after us. The straight alley we had been walking along, ended in an open field. It took us a minute to locate the blue marker that would lead us into the woods. At times we needed to stop during the uphill sections in order to find the next marker, for there were a few areas that switched back up the hill. During the last few explorations, I have noticed that the marker that the lead person cannot see due to some obstruction, the person following can. It gave me something to think about concerning the advantages and disadvantages of hiking solo. The blue trail ended at the river. Once again we studied the expanse of white field unable to discern the river without the help of the terrain suggesting a riverbank. The animal prints we had seen earlier still continued along the river. After taking in the view, we turned to locate the orange loop trail. Unlike the blue trail which took us through woods and ended at the river, the orange trail followed the stream until it intersected once more with the blue trail. Here we did not have to work so hard breaking a trail since we could use the prints we had laid down earlier. On our way back down the lane towards the car, I decided to try out the macro lens attachment for my compact camera that I had received for Christmas. I was quite pleased with the results. Exploring both trails had been about 1.5 miles but snowshoeing being a bit harder than walking, the journey had taken about 2.5 hours. It had been the best day for some real snowshoeing this year.